Over the past year, we at KHInsider have been launching a new series of interviews where we talk to various people who've been involved with the series! We're really pleased to present this interview we did with Tasha Sounart from Pixar. If that name sounds familiar, it should. Aside from working at Pixar and being the creator of Double Fine's Costume Quest, Tasha was at D23 this year when Square and Disney revealed the Toy Story world. 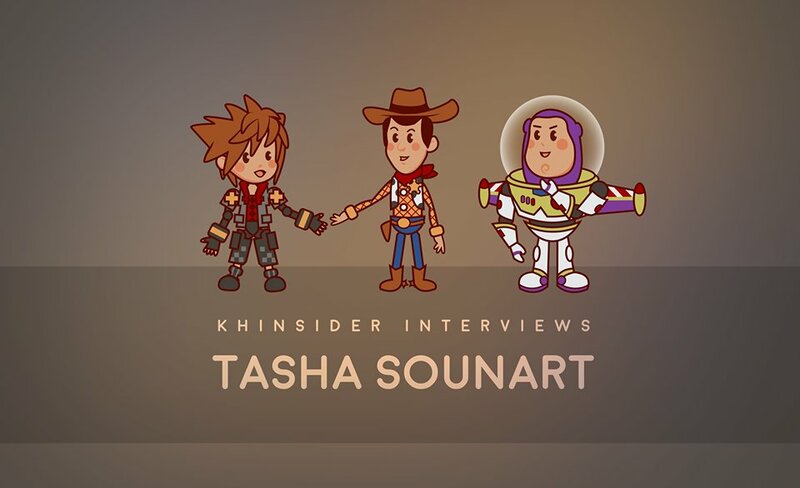 Tasha is a consultant from Pixar on Kingdom Hearts III and has been helping Square bring the Toy Story world to life. PJ: Let's get started! Tasha, just looking into your history and your background, it seems like you are the perfect person to be qualified for being a consultant for Pixar and Square Enix and Kingdom Hearts III. I wanted to talk a little bit about your past, going into CalArts, and then Pixar, and Double Fine, and then back to Pixar. It seems like you've had quite the journey. Can we talk a little bit about how you got started with your interest in animation, and video games, and film? Tasha: Sure. I guess I originally got interested in animation through comics. I was always really into comic strips when I was a kid. I just loved comics and The Simpsons was my favorite cartoon. I learned about animation through a summer school program called California State Summer School for the Arts. It's still going on, so if you live in California, it's a good program to look into if you're a high school student in California and you're into the arts. That was the first animation class that I took. From there, I was hooked. I ended up going to CalArts and studying 2D animation, so this is before computer animation was really popular. It was just getting started. When I was in college, Toy Story One came out. I remember the people from Pixar came and talked about it. I just thought it was really cool. Growing up, also, I really liked video games. I always, ever since the Atari, I've been a gamer. Computer animation seem to me almost merging these two things that I loved, which is comics and video games, into this one art form. It really appealed to me. At the time, a lot of animators didn't really want to work on the computer, because they thought they would have to give up drawing, which is funny, because now I spend more time in my day drawing than I do actually working ... I mean, I am drawing on the computer, but, you know. When I was at CalArts, we have this thing called The Producer's Show, which is where all the students show their student films. They have a portfolio day where different studios can come in and look at the students' work. Pixar asked if I wanted to do an internship through The Producer's Show and through the portfolio review. Of course, I said yes, because I was super excited. After doing a summer internship at Pixar, then they asked if I would come and animate on A Bug's Life. After doing the summer internship, I actually went back to school for another year, and then I came and worked at Pixar on A Bug's Life. That was my first feature film. PJ: Wow. That's pretty awesome. In your art, because I've perused a little bit of stuff that you've done, just your personal art work... Is it safe to assume that there are some JRPG influences? I can feel a little bit of EarthBound in some of the stuff that you've done. Is that a fair assessment? Tasha: Oh, yeah. EarthBound is probably my favorite video game of all time.. Yeah. RPGs are really my ... I just love RPGs, especially Japanese RPGs. There's something really quirky about them that you don't get a lot of in American RPGs. They're willing to try weird stuff that people here would never think of, which really appeals to me. Also, I just love cute things, so the Japanese aesthetic, I just really like it. Tasha: Yeah, so EarthBound, I would say is one of my influences definitely. For some reason, it just is really unique to me. This was before Pokemon and stuff. To see an RPG that was in a different setting, that wasn't a typical fantasy setting was really interesting, as well. I would say that is one of the things that I love about Kingdom Hearts, is it's not your typical ... they've created their own unique world for it. It's not your typical setting for an RPG, so I just like games that create a unique setting where you're just excited to explore it. PJ: It's funny that you say that, because when I ... I was in the audience at D23 when you guys unveiled the Toy Story world. When Sora and the group first jump into Andy's neighborhood, my first thought was, "Oh, my gosh, this reminds me of EarthBound in setting," even though Andy's neighborhood has been around since the '90s. There is just something about having a JRPG happen there. I was like, "This reminds me of EarthBound." Then, towards the end of the trailer when they're in Galaxy Toys and they're fighting the giant robots, and wow! Just being more experienced about Toy Story, it's such a perfect choice for Kingdom Hearts, and we're so excited. I'm also really excited that you, in particular, have been overseeing it, because you've also not only worked with Disney, Pixar and Square Enix, but also one of my other favorite game studios, Double Fine, where a little bit of that aesthetic and a little bit of your taste and choices have also bled over into other games. For example, the one that you led, Costume Quest. I definitely see the influences there. It's interesting to see how you balance that working there. It seems to be a lot of Double Fine and Pixar alumni, a familial relationship. You guys just bounce back and forth. Tasha: That makes it easy, because we don't ... If you wanted to work at the other studio, you don't have to move. We have a lot of ... It's a very small industry, so a lot of people ... I knew Tim Schafer before I worked there, through some mutual friends that worked at Pixar. Everyone kind of knows each other. We're all one happy family. PJ: Kingdom Hearts does the same thing. Tasha: Yeah, yeah! That's definitely something that it's definitely an aspect of both companies and of Kingdom Hearts that really appeals to me. I wouldn't say it's trying to appeal to everyone, but there's something that's innocent about it. You know? Tasha: Where it's not ... you don't have to be afraid that your kids are going to watch you playing it, you know? It's a pure and innocent and joyous. PJ: Yeah. I would say that's definitely a trait that I see that connects all of these projects is to the earnest way of approaching storytelling. I really appreciate that. PJ: It definitely seems like you are the perfect person to be the liaison between Disney and Square, and working on the Toy Story franchise and the Kingdom Hearts franchise. Because of that, were you suggested, or did you throw your name into the ring? How did you become involved with creating the Toy Story world in Kingdom Hearts III? Tasha: When I came back to Pixar after working at Double Fine, I was talking a lot with ... We have a very small interactive group here. It's only about three people. I was talking to them a lot about working with them on projects, because they didn't have a person that was dedicated to their team who was a creative person. A person that knows the characters, knows the stories. They were really excited when I came back to Pixar, because they were like, "Oh, my gosh. This is somebody who's had a long history with the company, and has worked in games, and wants to work on games." Rob Rowe is the leader of our interactive group here at Pixar. He was just really excited to have me working with their team in general. I actually work on several interactive projects here, and it's something I really love working on. My main part of my job is in theme parks, but it's actually similar to theme parks, because I feel like you're building interactive art. PJ: Yeah. With theme parks being more immersive now, especially, too. I can definitely see that connection. Tasha: Yeah, yeah. I do work on a lot of interactive projects, but when Rob mentioned to me that they were thinking of doing Kingdom Hearts, I was like, "Oh, my God!" I basically freaked out. I was like, "Yes. Yes, I want to work on that. Yes, we have to do that." I guess it was a mutual ... it just happened to work out well. I really wanted to do it, and they really wanted me to help out with it. All the pieces fell into place. PJ: That's so awesome. Do you mind if we get into some of the technical aspects of development for the series, without getting into the spoilers of things that haven't been announced, of course? PJ: For one thing, it looks absolutely gorgeous. It's so exciting for us as Kingdom Hearts fans, because as you know, this is the first next gen Kingdom Hearts title where we can play the games on the console and have these amazing graphics. Kingdom Hearts has always been beautiful, but to have that kind of fidelity where you look like you're playing a Pixar movie, is insane. Of course, it's absolutely beautiful. I know that Pixar and Square both have these strong commitments to deal and quality. I can imagine that working on that very stringently, you guys have knocked it out of the park. You mentioned a little bit at D23 that you were really excited to design Sora's Keyblade for the world, and also to work on the new outfits for Sora, Donald, and Goofy. Can you talk a little bit about the design process for those? Tasha: Yeah. Basically, Square Enix, they'll do the first pass of the stuff. Then, it's a back and forth conversation. Our, I guess you would say Toy Story franchise expert, is Bob Pauley, who is a concept artist here and also designs a lot of characters and has been here for a really long time. He was in on all those meetings when we were talking about the design of the world, the design of the Keyblade, the design of the toy versions of Sora, Donald, and Goofy. There's just several rounds of back and forth of like, "Let's add seams to their joints to make them feel more toy-like," or, "Let's make the screws larger so that you can really like it's a toy." Because, we definitely wanted to make them feel different than ... Because, there are actual action figures of Sora, so we didn't want to make it just look like the actual action figure. We wanted to almost make it more retro, because Toy Story is all about retro toys and make it look ... We emphasized the blockiness of it, just so that ... I feel, as a player, that it's more fun to see a version of the characters that's different. You want to see what they look like in that world. It's like, "Oh, fun!" PJ: I really like it. I like that they're definitely designed to be familiar in a central ... I can see that like, "Oh, it's kind of Lego in how square it is, but it reminds me of early '90s/late '80s anime, like Gundam style action figures. But, it's totally unique. I think it's really interesting that it looks like a blend of cultures of East and West, similar to how Kingdom Hearts itself is. Tasha: Yeah, that was actually something that we did on purpose, where when we were designing the toy store, and when Square Enix was deigning the other toys that would go in the toy store, like the enemy toys or just the ones on the shelves, that we definitely told them, "This should look like the Japanese version of retro toys." Because, this is a Japanese game, and Sora is a Japanese character. We wanted their Japanese flavor in the Toy Story style. So yeah, they do have toys that look like a Japanese mech. The robots that they fight with are very Japanese style. We said, "Because this is a Japanese toy store, then it makes sense." PJ: Nomura has said that what we saw in the trailer is just the beginning of that store. That there are multiple levels with multiple game play mechanics and gimmicks. It's so exciting to think about actually exploring that toy store as a tiny toy version of Sora and actually playing with the toys. It's so cool. Knowing that it's a new location. That it's not Al's Toy Barn, it's not Pizza Planet, it's something new for us. It's really exciting for us. Seeing that combination of new and old, a lot of fans have been praising the look of it, but they've also been wondering if Square has borrowed assets from previously existing Toy Story projects? Whether the models and different assets were borrowed from you guys, or if they built everything from the ground up? Tasha: We gave them reference models, but then they built everything themselves. Tasha: Seriously, when I see the stuff in the game, I am constantly amazed at how good it looks, because their attention to detail is amazing. Tasha: Yeah, yeah. Yeah. Again, it's a back and forth conversation where they will send us their version of the model, and then we review it. Then, we point out areas where it could be better. Really over all, this is probably the best that our characters have looked outside of our movies, because their attention to detail is really, really great. Tasha: That's one thing about Toy Story is, I think, a hallmark of Toy Story, a trait of Toy Story, is that there is this big group of characters. If you only had Buzz and Woody, I just don't think it would feel as much like Toy Story. You wouldn't feel like you're really in Andy's room. You'd be like, "It feels really empty." Tasha: I think having that many characters was important in getting the feel of Toy Story in there. Tasha: Yeah, they've been doing an amazing job with the animation. I've been reviewing the animation as they've been going along, and it's all looking so good. It's just really fun. Really fun stuff to review. Tasha: Oh, they are? I didn't hear that. Tasha: Cool. I'm so excited! PJ: We haven't seen any prototypes or anything, but that's what the word from Square was. I was actually going to ask if you were excited to think about merchandise stuff that you've helped create being brought to life. Tasha: Oh, yeah, totally. Totally. I have a whole shelf, now, of Kingdom Hearts action figures, so I will definitely have to add those toys to my shelf, because I totally thought that they should make those. I'm sure it wasn't my idea. The other thing that we've been thinking is it'll be cool to see the cosplay. PJ: I feel like it's just around the corner. As a creator, is that one of your favorite things to see people's interpretation of the work that you guys have done? Tasha: Oh, yeah. Totally. I think that's really one of the most fulfilling feelings of my job is when we get fan mail from kids and little kids' drawings or ... yeah. You make this stuff, and then you put it out there in the world, and you hope that other people like it as much as you like it. Then, seeing that back from people is just really gratifying. When you hear about the joy that it brings people, it's great. It's why we do this. PJ: A lot of people are really excited for this. It's definitely my top pick for Kingdom Hearts III, as well. It sounds like Nomura has wanted Toy Story and Kingdom Hearts since the beginning. I'm so glad that it's actually coming into fruition. Tasha: As a fan, I've been wanting to see Pixar in Kingdom Hearts for so long, so I know how excited everyone else is going to be about it. PJ: Absolutely. As much as I wanted it earlier, now I'm really pleased with it, because if we'd seen it earlier, we wouldn't have gotten the representation and the quality that we have with this current gen.
Tasha: Yeah, yeah. That's true. PJ: That's so exciting to me. What was the most important thing, to you personally, to translate from the Toy Story franchise into Kingdom Hearts? What aspect of the series did you want to remain faithful? Tasha: I guess, just as an animator, just making it feel believable is really important to me. Just making sure that Buzz and Woody and all the other characters feel like the characters. Tasha: For example, sometimes because all the animators are Japanese, sometimes they will do a gesture that is the correct gesture for them in Japanese culture, but it's something that Buzz or Woody wouldn't do. Sometimes, I have to point out, "Oh, well, we don't do that here." Buzz and Woody are supposed to be American characters, so they wouldn't bow, for example, or something like that. Yeah, I guess, just making sure that the characters are believable. Basically, don't do anything too out of character. PJ: Well, Tasha, thank you so much for taking the time to do this interview with us. We really appreciate it. Hopefully in the future, next year once the game is out, and there's been some time, hopefully, we can do something like this again without the red tape and as a post-mortem. I think that would be a lot of fun. Tasha: Yeah, that would be great. I'd be happy to. PJ: Okay, great! Thank you so much. I'll edit all this together, and I'll send you guys copy of it. Really, I appreciate it so much. I hope you have a great day over there. Tasha: Okay. Thank you. Looking forward to seeing it! We've got a lot of people to thank for this interview. Of course, Tasha Sounart and Briana Gardner from Pixar for helping to set this up - as well as everyone from Pixar PR, it was great working with you guys, thanks so much for the quick turnaround! Another special thank you to Square Enix for approving the interview! We'd like to do more stuff like this in the future with people who work behind the scenes of the series, so let us know who you think we should interview next! I really enjoyed this interview. Great work. Gaming is such a secretive industry, so any glimpse into the development process is so wonderful. Based on this interview, we can see how much thought goes into portraying the characters. I wish of mine is to get a "making of KH3" documentary. It would be so amazing. Please keep on with these interviews. Gaming culture can be so toxic, so developers are afraid to tell us more. But this just makes people realize how much work actually goes in. I woke up in the middle of the night and I don't think it's a coincidence as to why. This is an amazing interview with so much interesting information being revealed, I hope you get another opportunity like this with Walt Disney Animation Studios. That's one thing about Toy Story is, I think, a hallmark of Toy Story, a trait of Toy Story, is that there is this big group of characters. If you only had Buzz and Woody, I just don't think it would feel as much like Toy Story. You wouldn't feel like you're really in Andy's room. You'd be like, "It feels really empty." I hope this is a mindset they have for the other worlds regardless. Pretty sure that this was always the case ever since the very first Kingdom Hearts. The only reason as to why it's more noticeable now is because of Disney's strengthening relationship with Square Enix in regards to the franchise direction (that, and the fact that it's the only Disney video game franchise to remain relevant ever since its inception). I mean there was always a good amount of characters missing in other worlds outside the main cast like the Sultan, Gaston, rest of the lost boys, king of hearts, Caterpillar etc. I wouldn't even necessarily mind the lacks of general generic npcs in worlds if we could at least have every supporting character shown at least.